An experienced colleague at a high quality coating company was faced with a production problem. What had been a reliable product for many years was now proving difficult to manufacture. The evidence suggested that it was due to batch-to-batch variation in a key polyester resin raw material. But each batch met all the supplier’s specs, the supplier is a reputable, quality conscious company so there were no obvious indications that anything was wrong. The colleague decided to use his standard HSP measuring setup up with 25 solvents (always good to have around!) to check out the HSP of each batch. 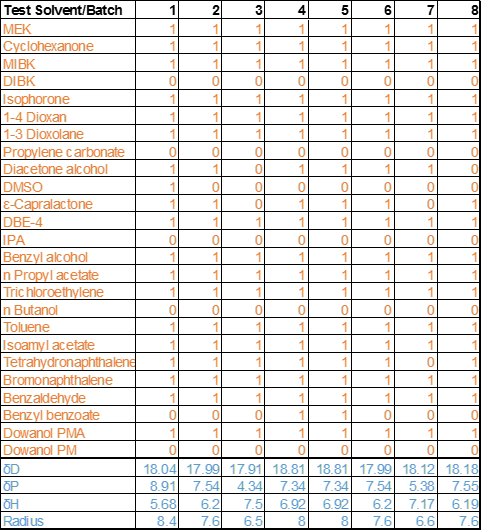 As show in the table what he found was quite alarming – 8 different batches of the "same" resin showed significantly different solubility behaviour (1=Soluble, 0=Insoluble) in some of the test solvents and the HSP values and radii were changing significantly. Armed with the evidence it was possible to hold a dialogue with the supplier who could not deny such compelling evidence. From the pattern of variation in the HSP values the supplier was able to make reasonable hypotheses about what was happening with their proprietary production process and were able to implement internal checks that allow them to ship only batches that are in the relatively narrow “sweet” zone that allows the product to be made, once more, with good quality and reliability. This is a great example of how HSP as a relatively simple technique can reveal deep insights into a complex resin system.